Throughout their clinics, RoMed rely on JVC diagnostic monitors. RoMed runs clinics at Bad Aibling, Prien by Lake Chiemsee, Rosenheim and Wasserburg am Inn. Every year they treat over 50,000 inpatient and about 90,000 outpatient patients. With in total 1050 beds, RoMed provides professional medical services that are convenient and secure for the district’s inhabitants. As the central x-ray department, the Institute for Diagnostic and Interventional Radiology supplies all the other medical departments of RoMed Clinics. “At each facility we have a CT and a Bucky workstation, in Rosenheim they have an MRT, two spiral CTs, a magnetic resonance scanner and three more Bucky workstations,” explains senior consultant Dr. Gunnar Tepe. 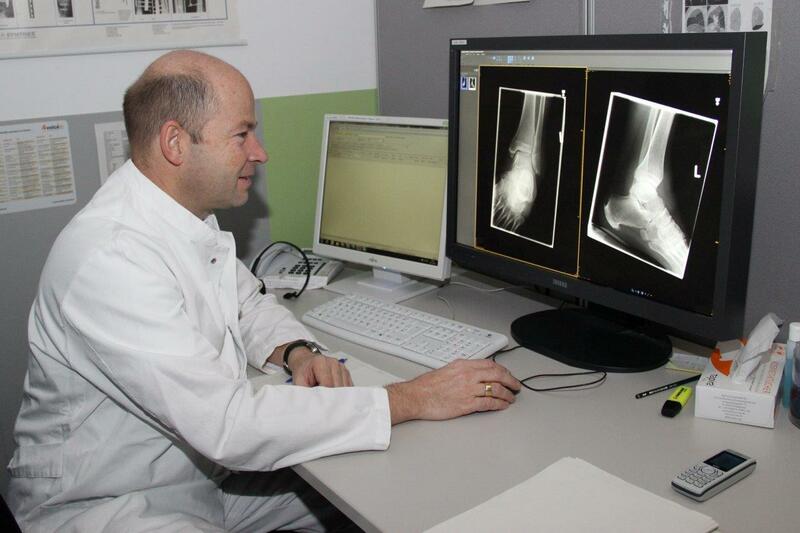 He works with 18 colleagues to treat about 56,000 patients per year and examines about 115,000 x-rays. There are now nearly 40 JVC displays in use in RoMed clinics, in radiology CCL650i2 and CCL258i2. “Both in conventional radiography and in cross-sectional diagnostics from MRT and CT, both have a very good image quality,” summarises Dr. Müller. Four CCL550i2 displays are making mammography imaging much more comfortable. “A central bar used to divide the images, but now we can take the images in colour and examine them on a large display,” says the senior consultant. The delight of users’ is generally due to the good image quality. It is ensured in RoMed clinics by QA Medivisor. When a new monitor is installed, the IT department runs the acceptance test with the software and documents the values in the software. They are then used as reference values for further constancy tests. A window pops up in the software for the daily visual inspection and guides the radiologist through the process step by step. “We are currently testing the new PM Medivisor Agent software, which should offer us considerable savings with acceptance and constancy tests because it combines calibration and quality assurance in one solution,” says Hitzelberger. Norm DIN 6868-157 has given new momentum to the topic. In the future, PM Medivisor Agent will use the monitor’s integrated sensors for constancy tests, so that external measuring devices will no longer be required for it. That will save a considerable amount of time. Future technology today. From December all 6 operating theatres at RoMed’s Rosenheim clinic will be equipped with large-format all-in-one OPERION 346 solutions from Rein Medical. Using the integrated computer, with PACS all the data and images desired, including those during the intervention, can be loaded and viewed on the 46 inch monitor. “We were impressed by the modularity and concept of the monitors,” says Stephan Hitzelberger, describing the decisive criteria. The whole solution, including the keyboard is hygienically designed and easy to disinfect. Another benefit: If there is a fault, each component can be replaced separately. “And last but not least, Rein Medical’s reputation for good service was a reason to choose the new OP solution,” says Hitzelberger.